MickeyTravels is excited about our new initiative – The MickeyTravels Agent Virtual Meet & Greet. We will feature a different MickeyTravels agent on a daily basis. We’re proud to have the best Disney Travel agents in the world as part of our MickeyTravels team and this will allow you to get to know them even better. Today the spotlight shines on Michelle Bradford, from Covington, GA! First memory of Disney? Being a little girl and telling my daddy I was going to marry a prince and live in Cinderella’s castle. What makes Disney MAGICAL in your eyes? Because it just amazes me that one man had that big of a vision and could bring it to life and even though Walt Disney is gone his dream and vision has never died no matter how many times I walk thru those gates and up Main Street USA It never loses its magical touch to make me feel like a kid. Favorite Disney destination and why? Walt Disney World Magic Kingdom because I a princess at heart and I love Fantasy Land and the castle. Favorite Disney Character and why? Sleeping Beauty this was always my favorite fairy tale And my all time favorite Disney movie. Favorite Disney Attraction and why? This would be Its a small world it was the first ride I ever got on at Walt Disney World when I was little and I have loved it ever since. Favorite Disney Resort and why? The Caribbean Beach Resort. I love the tropical feel to this resort and I love the pirate rooms. Favorite Disney Restaurant and why? Oh this is a trick question I love them all but if I had to pick just one it would be 1900 Park Fare at the Grand Floridian again I am a princess at heart and I love there dinner with Cinderella and Prince Charming not to mention the food is awesome. Favorite Disney Quick Service Restaurant and why? Pizza Planet – I love toy story it’s a must see. 3 Disney characters you’d like to have dinner with and why? Sleeping beauty Prince Phillip and Maleficent I love these guys and think this would be the ultimate since it is my favorite movie. Favorite Disney snack and why? 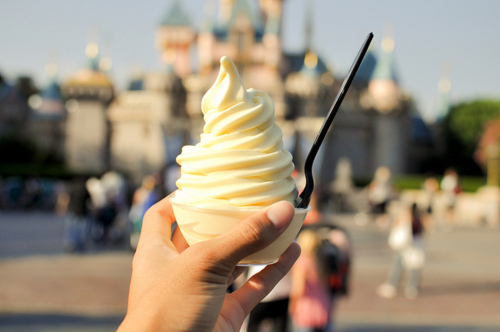 Dole Whip – there are no words to describe how good those are it is a must try for everyone. Favorite Disney Movie and why? sleeping beauty I love this movie because the Prince slays a dragon. 3 Favorite Disney Song and why? He’s a tramp from lady and the tramp be our guest from beauty and the beast once upon a dream sleeping beauty because all 3 songs remind me of my Prince Charming at different times in our marriage. Disney character you’re most similar to and why? 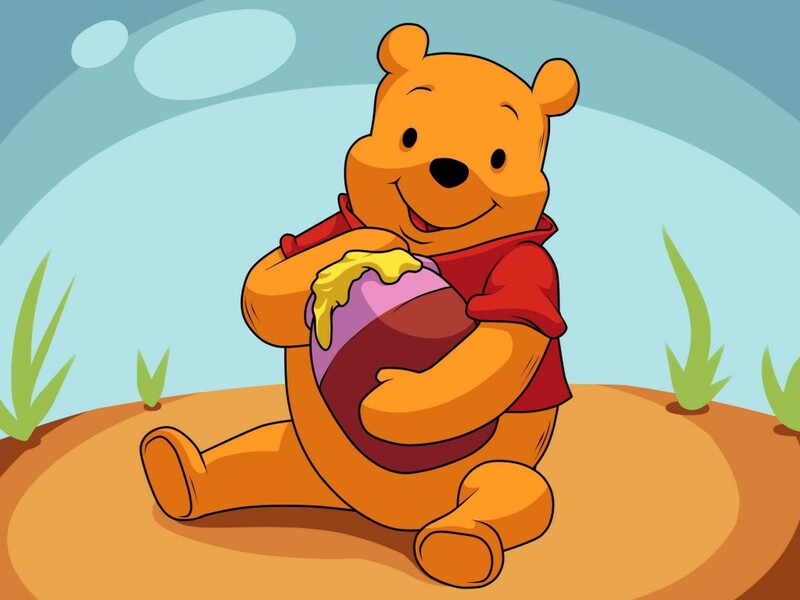 Pooh Bear because I love honey on everything. 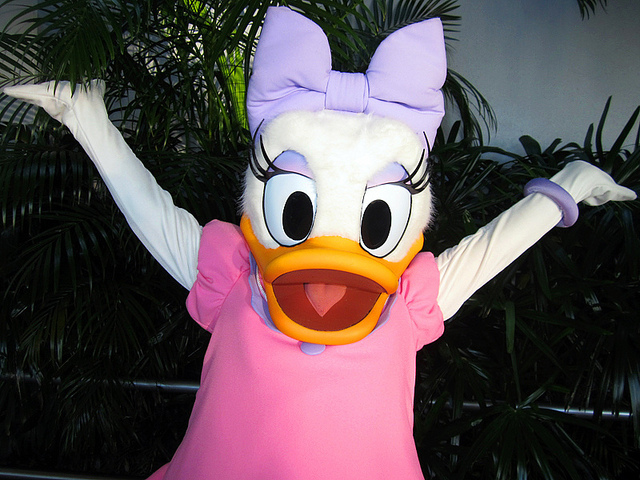 If you could be one Disney mascot for a day who would it be and why? Mickey Mouse because he is the mouse who started it all. 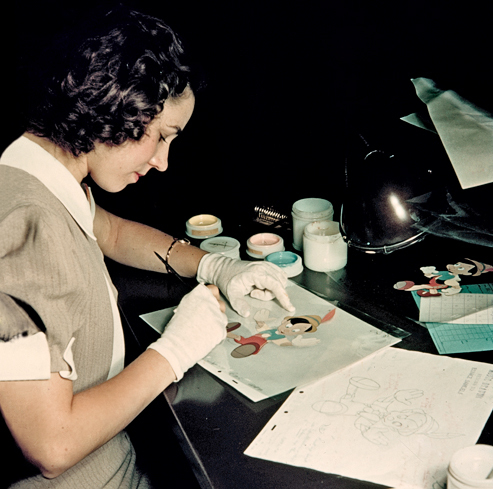 If you could work at one of the Disney theme parks, what job would you want and why? I would love to be an animator and help draw new characters and make up the story that goes with them. Best part about being a MickeyTravels Disney Travel Agent? I get to help families plan their dream trip to Disney and that is great because you get to help live out their excitement as if it were your own! Why should I book my vacation with you? I love any and all things Disney I have been a ” Disney Freak ” since I was 4 years old. It is a huge part of who I am and I get just as excited for you as if it where myself and I make it my job to make sure I can do everything to help you ale your magical memories. Feel free to reach out to Michelle with any questions or comments. Michelle can be reached at mbradford@mickeytravels.com or 1-770-597-1243. She can also be found on our website at www.mickeytravels.com/michelle. Where are you from? I grew up in New Jersey and now live with my family in Maryland. First memory of Disney? Riding in the front car of the monorail with the conductor and my Mom, Dad & Brother as a kid – it was so special! What makes Disney MAGICAL in your eyes? Every visit to a Disney destination makes me feel like a kid again – and that never gets old! Favorite Disney destination and why? Tough question! I have 2 – The Magic Kingdom because I can relive my childhood memories through my children’s eyes when they light up with excitement from some of the same experiences I had as a child – truly priceless! The other is EPCOT. I have great memories of EPCOT with my family and will always be able to sing EPCOT’s soundtrack thanks to my Mom & Dad buying it on a trip in the 80’s! Favorite Disney Character and why? 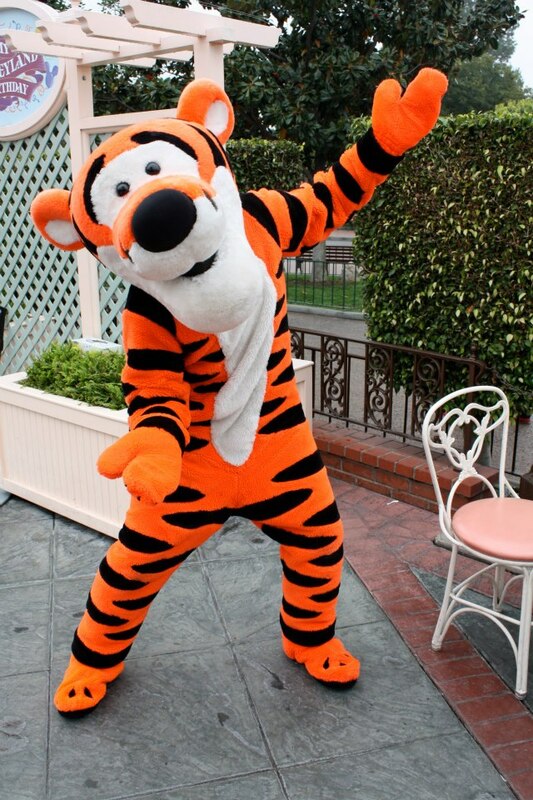 Tigger, always had a soft spot for him! Favorite Disney Attraction and why? Pirates of the Caribbean because it is a classic that has been updated, and is one of the lengthier rides! Favorite Disney Resort and why? I love the Wilderness Lodge for many reasons – it’s a beautiful resort, in a fantastic location near Magic Kingdom, and it gives you the sense of being away from it all when you’re only a short boat ride away from all the magic! Favorite Disney Restaurant and why? Hands down Ohana’s at the Polynesian Resort- the food is superb, great view of Magic Kingdom and the kids always love it! Favorite Disney Quick Service Restaurant and why? I love the food at Sunshine Seasons inside The Land in Epcot. It is always so fresh (some of it comes from The Land) and it is a great location to grab a quick bite before heading to the next attraction! 3 Disney characters you’d like to have dinner with and why? Goofy for laughter, Jiminy Cricket for life lessons and Captain Jack Sparrow for love! Favorite Disney snack and why? A dole whip from Aloha Isle because it’s delicious! Favorite Disney Movie and why? Pirates of the Caribbean The Curse of the Black Pearl because I love Pirates & Johnny Depp. 3 Favorite Disney Song and why? “AMERICA” from EPCOTS The American Adventure because it is a very powerful song. “Dream Come True” – a great memory of my family riding as the Grand Marshalls of the Magic Kingdom’s Dream Come True parade in 2011. 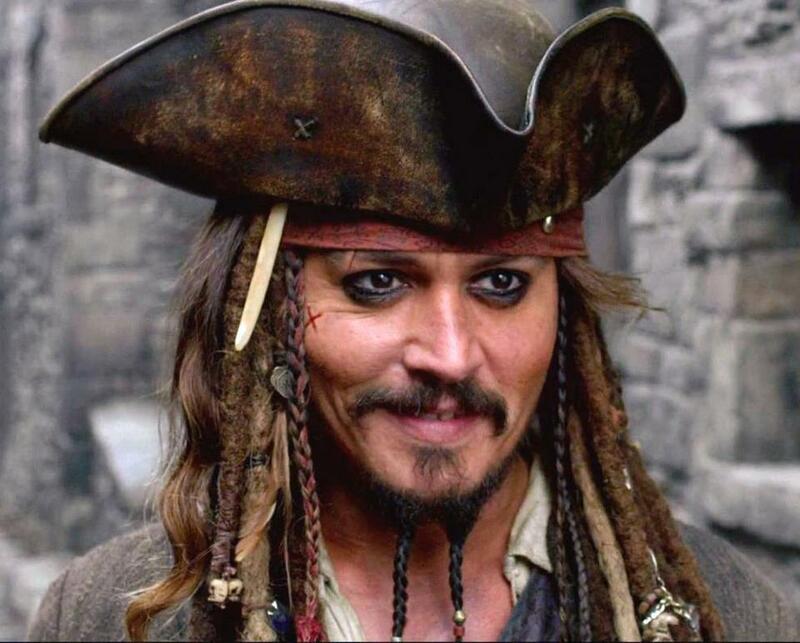 Yo Ho, Yo Ho A Pirates Life for Me because I can’t get enough of it! Disney character you’re most similar to and why? I would have to say Daisy because I love flowers & have a green thumb. If you could be one Disney mascot for a day who would it be and why? 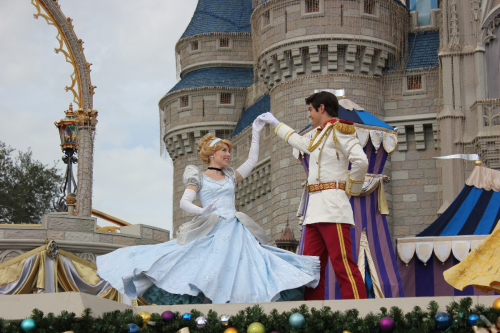 It would be very special to be Cinderella for a day! Best part about being a MickeyTravels Disney Travel Agent? We are a special team dedicated to making our client’s Disney dreams come true! Why should I book my vacation with you? I love helping clients plan their Disney vacations! Whether it’s a Disney Cruise or a trip to Walt Disney World, I will be as involved as you would like me to be while planning a magical Disney vacation for you and your family! 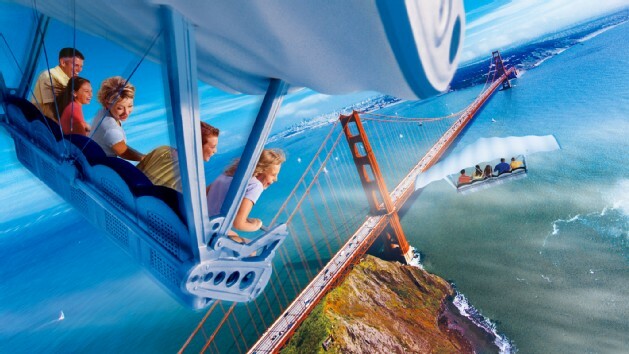 MickeyTravels is excited about our new initiative – The MickeyTravels Agent Virtual Meet & Greet. We will feature a different MickeyTravels agent on a daily basis. We’re proud to have the best Disney Travel agents in the world as part of our MickeyTravels team and this will allow you to get to know them even better. Today the spotlight shines on Jennifer Robertson from Tinton Falls, New Jersey! What makes Disney MAGICAL in your eyes? It makes you feel like you are in a protected bubble of fantasy, fun, joy and nuance. It is a true escape from the rest of the world. Favorite Disney destination and why? All Disney locations are special and amazing, but WDW is my favorite because it is so vast and varied. There is something to interest everyone I have ever traveled with, regardless of age, gender, socioeconomic background and personal interest. There is ALWAYS something new and exciting to discover no matter how often you visit. Favorite Disney Character and why? Princess Merida: I was so struck with what a strong female role model she was. Her spirit and willingness to “break the mold” was inspiring. She doesn’t look like the typical princess, but she is still strikingly beautiful. Plus I love seeing the little girls walk around the park with the long, wild, red locks wigs. Favorite Disney Attraction and why? Sorin. I am a chicken when it comes to rides, so once I saw the motion sickness signs, it took me a year or so to try it, (I told you, I am a chicken) but once I did, I was hooked by the beautiful views and free feeling that you get “sorin” in the sky. Who doesn’t want the super power to fly? Favorite Disney Resort and why? This is tough. I love so many for unique reasons (best pool, view, location)! I would have to say the Beach Club would win. They have THE best sand bottom pool and the ability to walk right into EPCOT or stroll along the water to Hollywood Studios is amazing! Favorite Disney Restaurant and why? Another tough one. I am a Disney Foodie so my vacation is full of favorite dining! I love Jiko at the Animal Kingdom Lodge. People are very scared to try it, but once they do they are hooked. It is a place where I always try something new, with unique flavors that I have never experienced anywhere else. Favorite Disney Quick Service Restaurant and why? 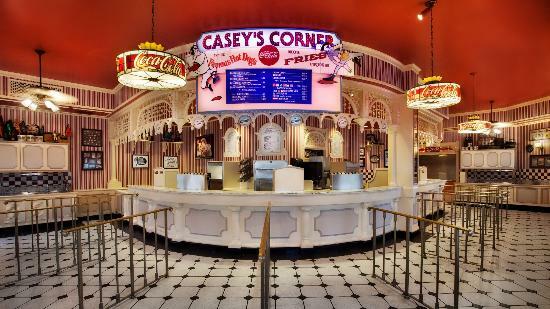 Casey’s Corner on Main Street in Magic Kingdom is our go to lunch spot when we arrive. They have awesome hot dogs and the old time baseball theme and bleacher seating is fun for the kids. I am looking forward to the expanded seating that they are building now. 3 Disney characters you’d like to have dinner with and why? Mater from Cars because he would make me laugh. Alfredo from Ratatouille because he would bring the yummy food. Belle would be the third because she would provide the interesting conversation. Favorite Disney snack and why? Homemade ice cream sandwiches! Favorite Disney Movie and why? The Nightmare Before Christmas- I love the artistry and the message behind the movie. You don’t have to be the best at everything. We all have our own strengths and challenges. Jack failed at Christmas, but that didn’t destroy him. He focused on his strength and thrived. I have never seen a movie that was so creepy, cute and funny all at the same time. 3 Favorite Disney Song and why? 1:“Belle” –My little sister is 14 years younger than me, so when Beauty and the Beast came out, I would use her as an excuse to watch Beauty and the Beast over and over again. I have such fond memories of singing this song to her when she was a baby. 2:“the bare necessities” –This one is from my childhood. I was very close to my grandparents and spent many a day watching old Disney movies. My grandpa passed when I was 10 but one of my favorite memories is him singing this song and me getting a giant bear hug from him at the end. 3:”let it go”- Like the rest of the mom’s of little girls right now, I listen to this song daily. The sound of my 4 year old singing this is extra special for me. My daughter has Down Syndrome and speech has been her challenge. I almost cried the first time I heard her belt out this song from the backseat. Now we do duets in the car every day and she plays Frozen DJ , dictating what track she wants on. Disney character you’re most similar to and why? Belle. I love to learn and read. I think I can be quiet and reserved, but also very assertive and outgoing when I am passionate about something. If you could be one Disney mascot for a day who would it be and why? Mickey Mouse of course! I love to hear young kids scream his name when they see him for the first time. Even adults are in awe. Mickey is so classic and he guarantees a special moment. 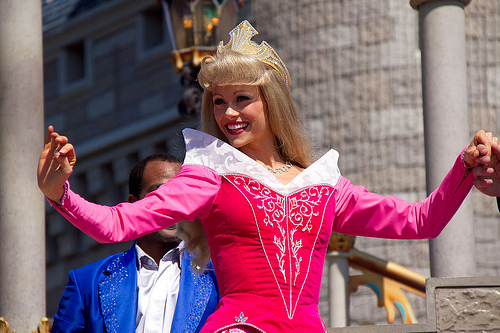 If you could work at one of the Disney theme parks, what job would you want and why? I would love to be a driver at the Kilimanjaro Safari at Animal Kingdom. I love looking at the animals and the fact that no ride is ever the same. Best part about being a MickeyTravels Disney Travel Agent? Getting to add magic to people’s lives. Everyone I have ever helped with a trip, comes back with photos, happy memories and gratitude for walking them through it all. Why should I book my vacation with you? I will care about your vacation almost as much as you! I am super eager and excited to share my Disney expertise and take all the guess work away from you. Together we will figure out your “vacation style” and personalize your Disney experience. I want you to say, wow that was easy, now all I have to do is have FUN!